Laceweight yarn (shown in Jade Cashmere Lace). 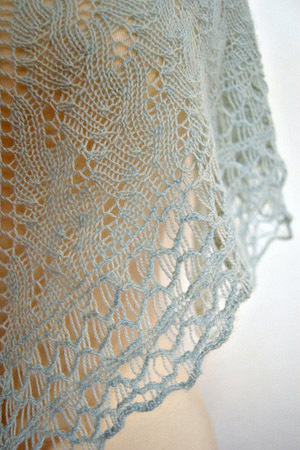 Description A simple triangle lace one skein shawl with a knit on edging. Needles Size US 5/3.75mm Knitting Needles, or size needed to get gauge. Yarn 55 grams of Jade Sapphire’s Mongolian Cashmere 2-Ply [100% Cashmere], 400 yards/367 meter or One skein of Lacey Lamb or Artyarns Lace 1 Ply Cashmere. 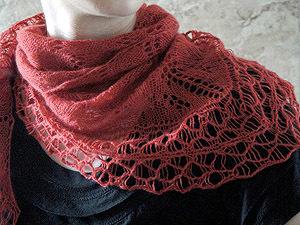 Total Shawl Yardage: 342 yards/314 meters. Gauge 16 stitches and 30 rows over 4 inches in Main Body Pattern Stitch.